Whilst the fact that everything in the .m file gets put inside of a comment seems kind of odd, this format has the significant advantage that the result is a readable and editable plain text file. Moreover, I can load the .m file back into the mathematica front end and interact with it as normal. This also leaves all of my formatted section headings etc. as they would be in the .nb file. This leads me to ask: what are the advantages to saving in the proprietary .nb format when one can store code and formatted text in a human readable .m file that also works interactively within the Mathematica front end? 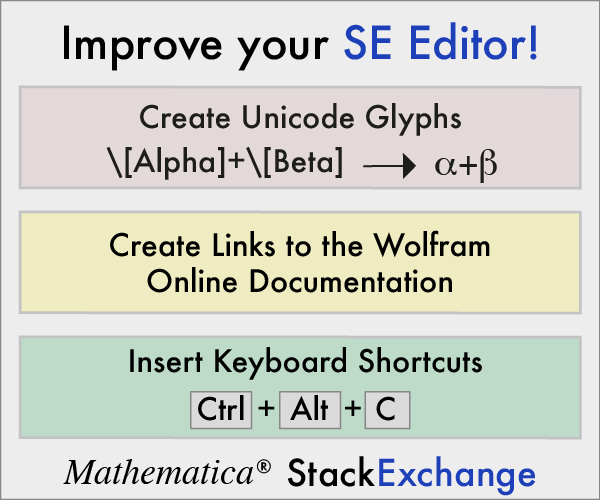 what are the advantages to saving in the proprietary .nb format when one can store code and formatted text in a human readable .m file that also works interactively within the Mathematica front end? After re-opening it all cells are gone, so you don't have the output and the inline cells anymore. Therefore, package files are very different from notebooks because they contain only pure input code, while when you create and edit a notebook in the front end, it contains a list of cells which support all kinds of formatting. It is only odd at first glance. The most important thing you have to know is, that when you save an .nb file as .m package, only initialization input cells become package code. Therefore, when you want to create a package from a normal notebook you have to mark the input cells and make a right click to set change them to initialization cells. Q1. Can you use multiple cells that are variously formatted in .m files? I think I showed already that this is not possible. Although, there is a but here which is that Mathematica will not complain when you change the file suffix of a notebook to .m. When you re-open this, you'll see the usual notebook interface and not the gray package view. Q2. Can you display two dimensional input? Q3. Can you leave output in the file? No, because without cells there is no way to distinguish for instance input from output. Loading the package later with Get would be a mess because your output would be evaluated as well. You might wanna try to put a plot or an image into a text-cell but you will be disappointed when you open the file the next time since you'll only see pure input text and no graphic. It's important to understand the guiding motivation for notebooks (.nb files) and packages (.m files). A notebook file is a full fidelity version of your document content. Nothing will be thrown away; every last twiddle and style is saved into the notebook. The resulting file has two primary purposes. One, of course, is to reconstitute your document at the highest fidelity when you load it into Mathematica. The second is to be able to load the file into the kernel for various kinds of document processing. This is done much less frequently but, for example, one could imagine a notebook file being used as a template for report generation, or content which is programmatically manipulated to personalize (or randomize) content for a classroom of students, or many other sorts of manipulations. These changes happen at the document level, so loading the file using Get into the kernel represents it as a document expression, not as the evaluated version of its contents. A package file is, first and foremost, a conveniently evaluatable form of the code you designate. Code is found in Code-style cells, which are the default cell type when you're editing in a package, as well as the style you get by using Cmd+8 or Alt+8 in a regular notebook. Input cells might also contain code that you might use in the notebook environment, but not code you wish to deploy (for example, test cases or boostrapping code). The most critical thing is that, when you call Get on a package, it evaluates your code and ignores your comments. Secondary purposes of package files include creating a serialized form which is readable by humans in other package editors (such as Workbench, or any text editor you might choose) and to reconstitute as much of the document as is reasonable without violating the other purposes. That explains many of the design decisions we made in package files. Why do packages strip output cells? Because it makes the package easier to read in a text editor, and stripping output cells will never affect evaluation. Why are Input and textual cells in comments? Because they should not be evaluated. Why does inline formatting get stripped? It's preserved, if necessary, to preserve evaluation semantics, but it otherwise so contributes to lack of readability in a text editor that it's just not worth it. Why does some typesetting get converted from 2D to 1D (for example, superscripts are converted to ^)? Because it preserves evaluation semantics while increasing readability in a text editor. Actually, both .m and .nb files have "proprietary" format and both are "human readable". The difference is the purpose. Packages use .m files, notebooks use .nb files. A package is reusable code. A notebook is more like calculations in scrap paper where you put notes, graphs, and computations. That is, a notebook is something that the end user would employ for daily calculations. A package is something that a developer writes. Further, when you load a package, all of the code in the package is interpreted at once. While you could execute all of a notebook at once, usually you interact with the kernel through the notebook (which is managed by the front end). Not the answer you're looking for? Browse other questions tagged notebooks or ask your own question. How to copy code out of notebook to an external text editor without extra line feeds being added? Writing cells from other notebooks into current notebook? Is there risk of corruption of comments added in a notebook outside Mathematica?